Amid concerns about the quality of the playing field in Mexico City, the NFL reportedly will determine within the next couple days whether to keep Monday’s Rams-Chiefs game there or move it to Los Angeles. 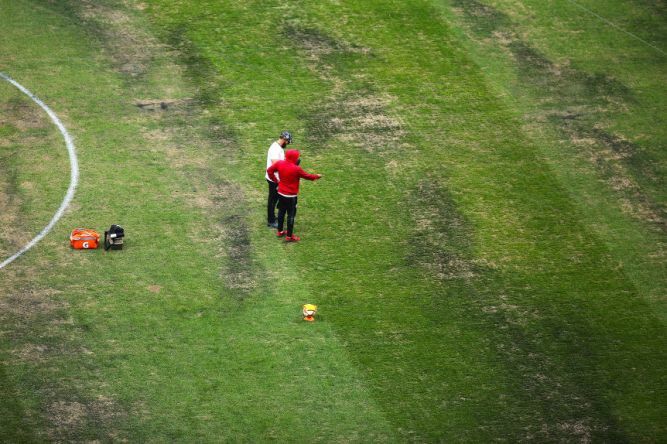 Reports from outlets such as ESPN and NBC Sports indicated the league has “significant” concerns about the Estadio Azteca field, which is a blend of natural grass and synthetic turf and has been compromised by recent poor weather and numerous events at the stadium. The high-profile international game remains likely to be played there, but the NFL has the option of moving it to the Coliseum. The Rams were required to play an international game this year because they are playing in a temporary stadium while their new home in Inglewood is being built. The Rams left Monday for a week of altitude-training practice in Colorado Springs, Colo., then were scheduled to fly Sunday to Mexico City. Should the game get moved, the Rams are likely to remain in Colorado for game-week practices. It’s been a difficult week for the Rams, many of whom were forced to evacuate their homes because of wildfires in Ventura and Los Angeles counties. The Rams even chartered a second flight this week to bring displaced spouses and children to Colorado Springs for the week. I'll make my backyard available! 1. I'll make my backyard available! It's far from regulation, but I'd love to see that game. I'll have beers for the players available afterwards. No brewskis for Brett Kavanaugh though. Persona non grata!